When it comes to Korean skincare, Essence is the heart of it all and is the one step that I would never skip on any given day! As many of you would know, a typical Korean skincare routine comprises 10 steps – Oil Cleansing, Foam Cleansing, Exfoliating, Toning, Essence, Serum/ampoule, Mask, Eye Cream, Moisturizer, Sunscreen or Sleeping Mask, but it’s not necessary that you incorporate ALL 10 steps into your everyday routine for beautiful skin, instead, I would recommend choosing a few products (maybe 3-4) that work great for your skin and then being consistent with that routine. 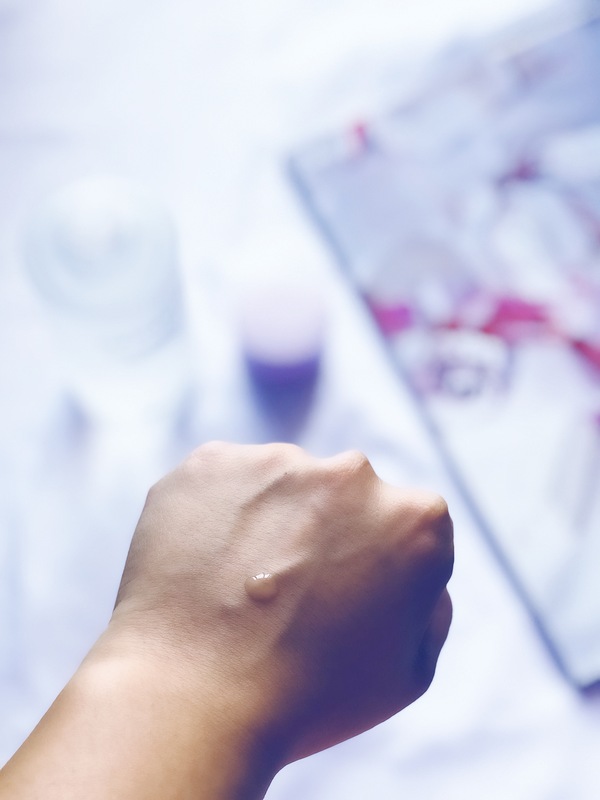 If you ask me, I would rather use an essence and layer it 3 times and skip a moisturiser altogether, because that still lets my skin breathe and also, I’ve not yet found a moisturiser that works a 100% for my sensitive, acne prone skin. For those of you who are new to Korean skincare and don’t know what an essence is, let me break it down for you – An Essence is essentially a more concentrated formula that treats skin on the cellular level and targets specific concerns like dullness, uneven skin tone, wrinkles and fine lines. 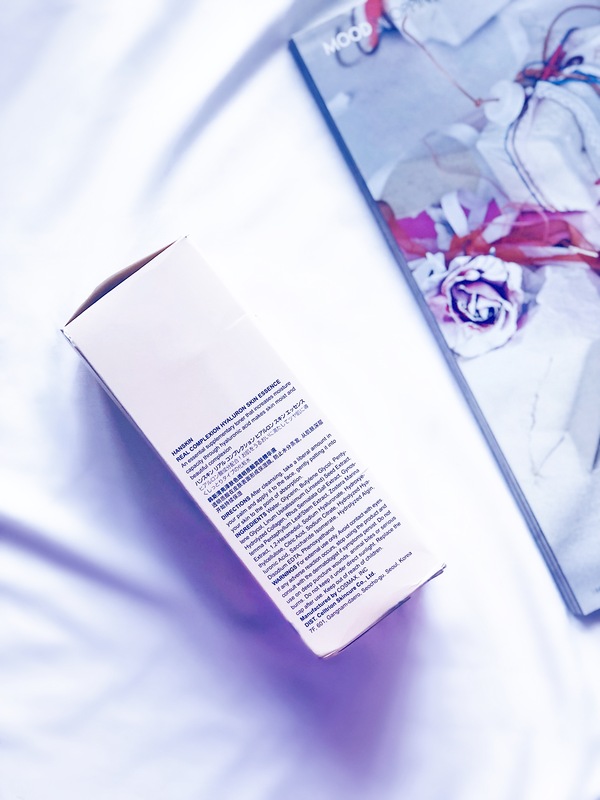 In Kbeauty, an essence is typically believed to optimize skin regeneration and if you use it religiously, you will see benefits like brighter, smoother skin that looks youthful and radiant. The essence comes in a 300ml plastic bottle with a very pretty pastel pink cap. The packaging feels sturdy, but because it’s such a big bottle, it is quite heavy and not very travel-friendly. The bottle comes inside a pink cardboard box packaging with all the relevant information like ingredients and directions printed on it. The bottle has a screw on cap and you basically tip the bottle over to dispense product on to your hands or a cotton pad (I personally always use my hands for essence). 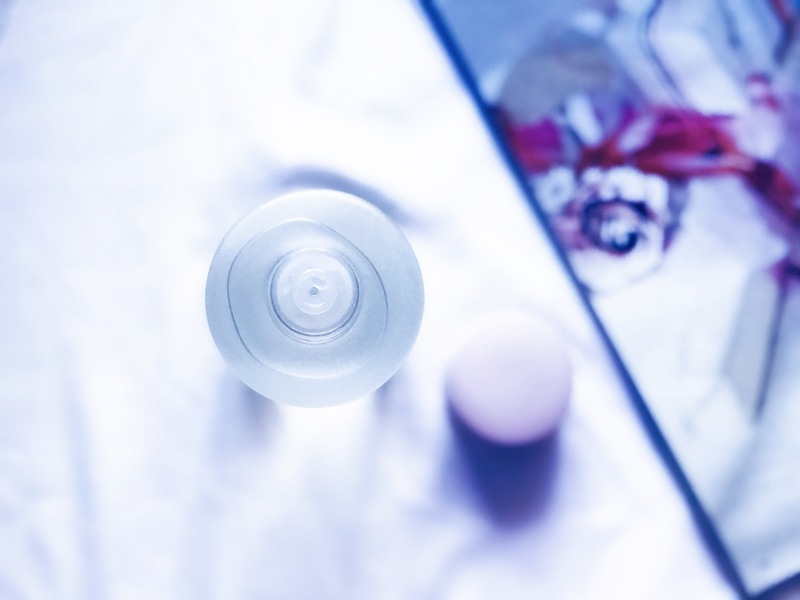 There’s a stopper with a small hole as you can see in the pictures and this ensures that the essence is released drop by drop – another thumbs up for packaging there! All in all, I quite like it. 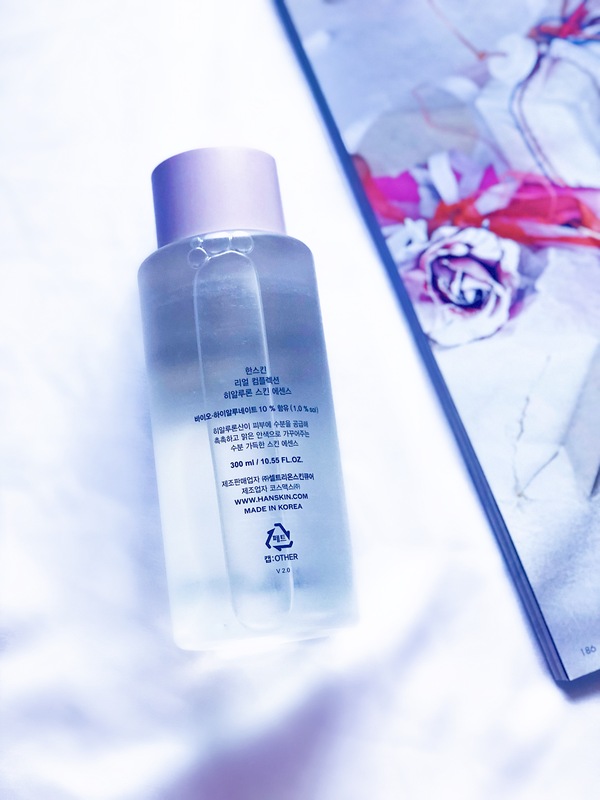 In terms of consistency, this essence is slightly thicker than water and very lightweight… I usually do 2-3 layers of it, using no more than 2-3 drops of the essence for each layer. The product feels very silky smooth to the touch (and almost bouncy in a way!) and soaks right into the skin, leaving it feeling very plump, bouncy and slightly sticky. Also, this essence has NO fragrance, which a huge plus in my books, because that way when I layer the product, there is no lingering scent on my skin. I love the idea behind this product. 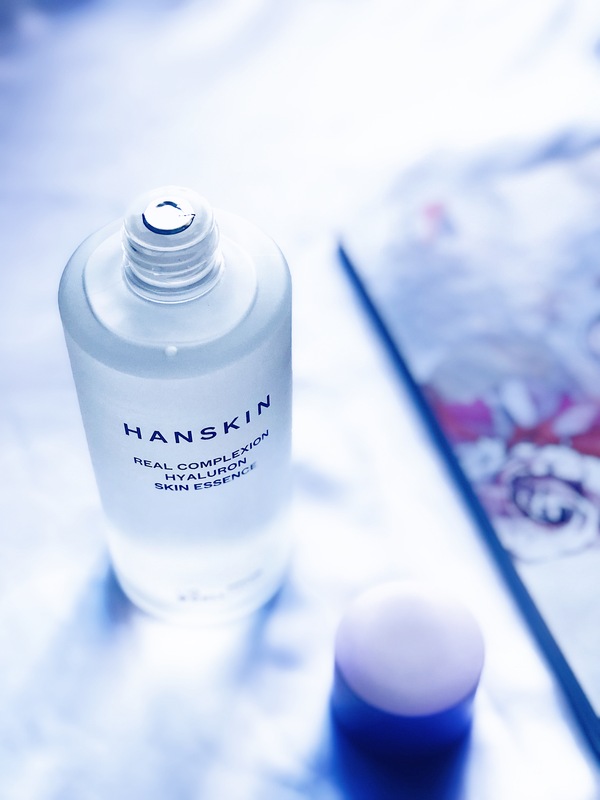 If you’ve used essences before, you’ll see that the Hanskin Hyaluron Real Complexion Skin Essence is a little bit different. 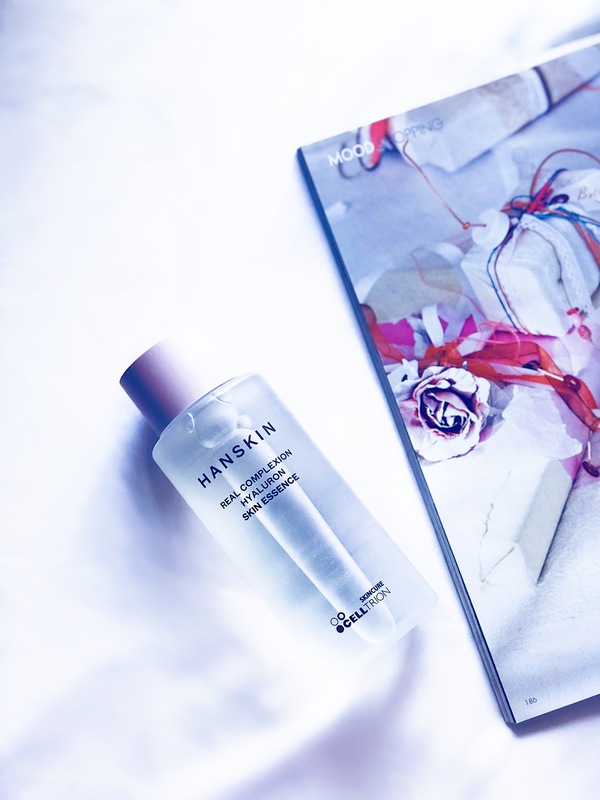 For example, if I compare it to the Missha FTE, the Hanskin Hyaluron Skin Essence is a bit more viscous and it almost feels like a hybrid of a toner, essence and moisturiser – all in one! Because I live in Mumbai, and the weather is very humid, I sometimes skip the toner and moisturiser step of my routine and just use the Hanskin Hyaluron Skin Essence as a layerable toner (2-3 layers) and what that does is it feels like a treatment + moisturiser as it boosts the hydration levels in my skin and makes my skin feel plump all day. As the name suggests, this product contains hyaluronic acid and so it is all about moisture. With consistent use, I have noticed that it has helped smooth out fine lines and has also drastically improved the elasticity of my skin. My skin has never felt more plump or dewy and I love that about this product. Also, it has never broken me out, hurray! 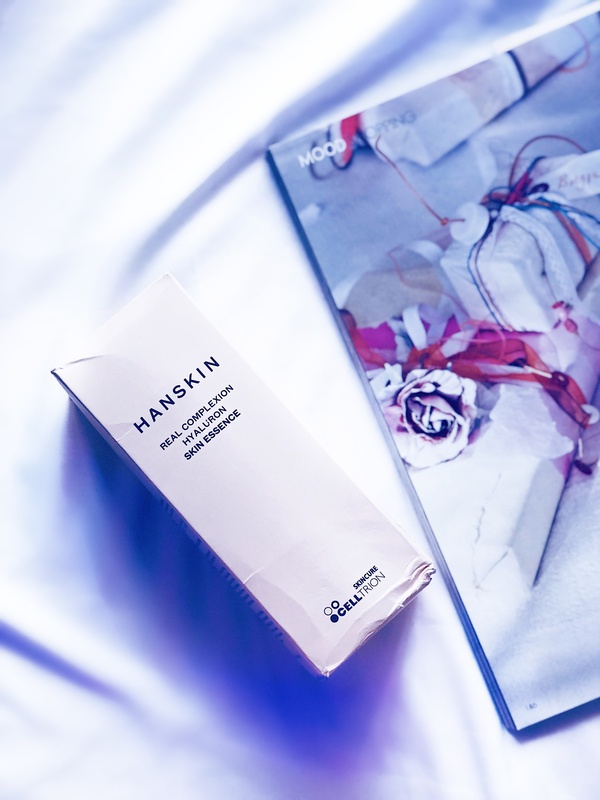 I honestly LOVE the Hanskin Real Complexion Hyaluron Skin Essence… I also think this would be a fantastic product if you want to achieve that glass skin! Do I recommend the Hanskin Hyaluron Skin Essence and Would I repurchase? – YES! Have you tried the Hanskin Real Complexion Hyaluron Essence? Do you have any favourite essences and recommendations? Please comment below! I’ll be sure to check out your recommendation of the Loreal Genius Water! Looks great! Would love to try Hanskin Hyaluron skin essence.